This uniform is date 1978. It is a US Marine Corps., Coat, Wn's, Summer, Poly/Ctn, Corded, AS160 (W/O Buttons). This uniform belonged to a woman, Marine, Private. The only insignia found on this uniform as of now are the cloth sleeve rank stripes of a Private, 1st Class and the 2 Eagle-Globe-And-Anchor pins found on the lapels. 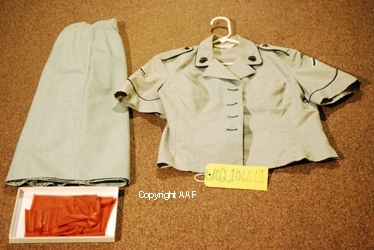 The buttons are currently missing from this uniform but are very easy to locate on the internet. Ths uniform includes a 1976 dated, matching color USMC, "Shirt, Women's, Polyester/Cotton, Corded, Green Shade No. 160". This uniform also includes a correct style pair of museum added commerically made stockings. The condition is EXCELLENT. This grouping is quite attractive. We had several that were dated before 1973 and they are all gone now. We only have a couple left of this popular style uniform. 1987 dated, US Army/Navy/Air Force, "Dress, Hospital Duty, Uniform" American Red Cross Volunteer's Uniform Jacket & Hat 1920's To The 1940's Period, U.S., Woman's, Pink Color, Summer Dress 1963 dated, US Navy, WAVE, Woman's Service Dress Uniform, belonging to Lieutenant Commander "E. Lindgren"